An innerspring mattress uses a steel coil support system. There are several types of spring systems, including those with springs connected into a single unit and units with individually wrapped pocketed coils. 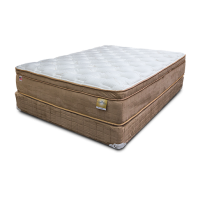 The spring shapes, designs, coil gauge and number of coils in a mattress can vary. The innerspring is covered by padding or upholstery materials, including various foams, fiber and even additional layers of smaller steel springs. In general, the greater the number of coils, the more points of support and the better the bed can contour and support the sleeper. Pillow-top mattresses have an additional upholstery layer sewn onto the top of the mattress, as if pillows were placed on top of it. This layer can be made from a variety of fiber and foam materials.